Jim spent most of 1988 developing material for his anthology show The Jim Henson Hour. With a premiere date the following spring, it seemed like an ideal opportunity to celebrate the first twenty years of his beloved Sesame Street. The resulting special, Sesame Street: 20 and Still Counting made for a joyous start and provided an opportunity to bring together his creative team. The special, hosted by Bill Cosby, combined talk portions, classic inserts from the show, and musical numbers. 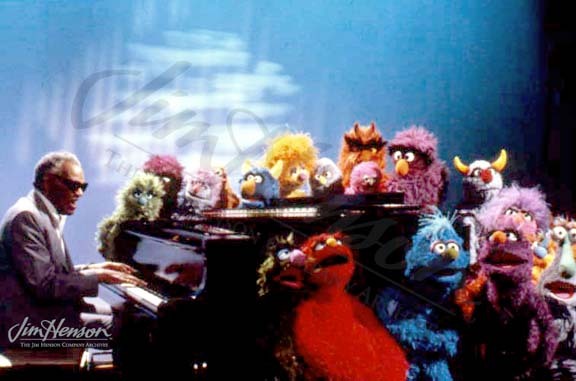 Ray Charles demonstrated the musical strengths of the show by singing Joe Raposo’s classic, “It’s Not Easy Being Green”, and singer Placido Domingo underlined the show’s inventive parodies in his interaction with Muppet Placido Flamingo. Perhaps most important, 20 and Still Counting allowed Jim to reminisce with his colleagues from the beginnings of the show – the puppeteers, the human cast, his co-creator Joan Ganz Cooney, and composer Joe Raposo. Jim and Joe had worked together as far back as 1965, and their collaborations included Joe’s Oscar-nominated work on The Great Muppet Caper. Jim noted in his journal that this was, “…the last time with Joe Raposo” whose premature passing the following February was a huge blow to all who knew him. Luckily, the work of both Jim and Joe lives on, delighting new generations of audiences. Learn more about Joe Raposo’s work with Jim. 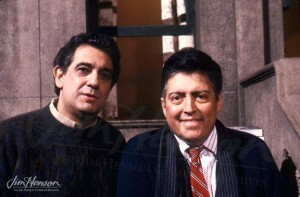 Placido Domingo and Joe Raposo on the set of Sesame Street: 20 and Still Counting, 1988. Ray Charles sings with friends on the set of Sesame Street: 20 and Still Counting, 1988. Bill Cosby and his friend Elmo on the set of Sesame Street: 20 and Still Counting, 1988. 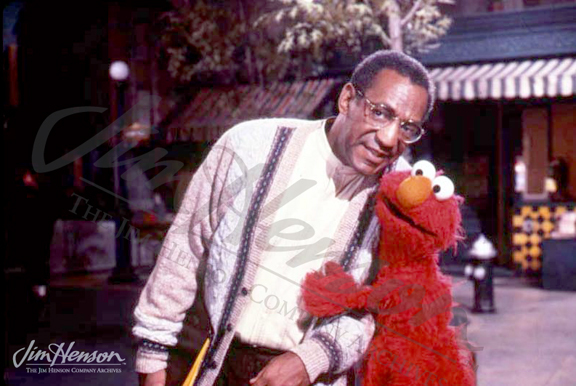 This entry was posted in 12-December '88, 1988, Jim Henson Hour and tagged Bill Cosby, Joan Ganz Cooney, Joe Raposo, Placido Domingo, Ray Charles, Sesame Street, Sesame Street: 20 and Still Counting, The Great Muppet Caper. Bookmark the permalink.